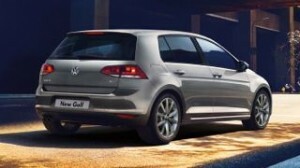 The Volkswagen Golf has been around since 1974 and is now in its seventh series. It has a justified reputation for being reliable, well built and desirable, the latest Golf is evolution personified, it retains the distinctive Golf look but subtle changes make this the biggest and best Golf yet. The extra 56mm in length and 13mm in width are used to excellent effect, up front the driver and passenger have increased legroom and are separated by an extra 31mm. Rear passengers have extra leg and shoulder room and Volkswagen have even managed to increase the boot by 30 litres. 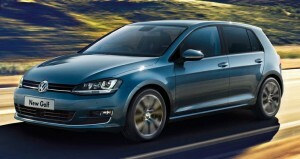 The latest Golf is 100kg lighter making it better to drive and more economical. The Ford Focus is still the best handling car in this class, the Hyundai i30 is the best value and the Alfa Romeo Giulietta better looking but the Golf makes for the perfect all-rounder. The cheapest version of the Golf is the S, which comes with air-conditioning, front electric windows, an 8-inch touchscreen with digital radio and a Bluetooth hands-free phone connection. We reckon it’s worth upgrading to the Match trim because this adds 16-inch alloy wheels, power folding wing mirrors, front and rear parking sensors, electric rear windows (on five-door models) and an adaptive cruise control system that keeps you a set distance from the car in front. The GT version of the Golf also comes with sat nav, 17-inch wheels and sports suspension, but this and the sporty looking R-Line model are a bit pricey. The two petrol engines are a three cylinder six speed 1.0 litre with 113bhp that offers over 58.9 miles per gallon and a very respectable 0-62 mph time of 10.1 seconds or a super new 1.5 litre petrol offering 130bhp called EVO which can reach 62 mph in 9.1 seconds and to a top speed of 130 miles per hour, it offers economy of 56.5 mpg as a six speed manual or 57.6 as a 7 speed dual clutch Automatic (DSG), this engine is also available with 148 bhp which does not dent the economy but reaches 62mph in a hot hatch time of 8.3 seconds. The two diesel units are 1.6 litre 115bhp with 5 manual gears and the 2.0 litre 150bhp, both are quiet and smooth and offer an excellent blend of power and economy, 68.9 mpg for the smaller diesel. 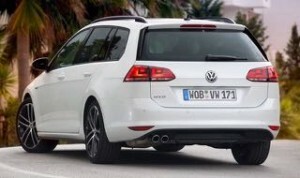 The Golf is being cleared to make way for the new model that arrives later this year, prices are patchy to say the least. There is very little not to like about the Golf GTD, enhanced further with a mid life pep up with added tech and light clusters, it’s one our favourite looking cars on the Scheme. Distinguishable from the regular car by its deeper front bumper, honeycomb grille, twin-exit exhausts, bi-xenon headlamps, tailgate spoiler, 18-inch wheels and sitting on independent suspension reduced in height by 15mm. The GTD treads the line perfectly between a fast hatch and usable, comfortable family transport offering room for four adults and a useable shaped boot of 380 litres. On the inside the GTD gets the GTI’s trademark tartan interior trim (albeit in a subtle shade of grey) and a racy-looking flat-bottomed steering wheel, 8 inch colour touch-screen control system for navigation, climate control and front and rear parking sensors. The Golf GTD only comes with one engine, and that’s a punchy 2.0-litre diesel with 181 bhp. It’s the diesel’s grunt at low revs that you’ll first notice when you accelerate hard, and the acceleration will raise a grin. It’ll propel the GTD from a standstill to 62mph in 7.9 seconds and on to 141mph as a six-speed manual or a DSG automatic with the seven gears. Fuel economy very impressive with the Manual car returning a claimed 70.6 miles per gallon and the Automatic 65.7mpg. The Golf GTD is a perfectly accomplished, quick diesel car that has a lot of class.